Now, to be clear, many people experience both of these sentiments, at some point in their life, depending on who is in office. I believe the current American administration has amplified these voices for many people. So, what are these beliefs actually rooted in? The way we experience reality is formed in our childhood. And, whether or not we are conscious of them, we all have childhood wounds, as well. As a result of these early imprints, as adults, we tend to project a parental relationship, and our childhood wounds, onto other areas of our life. One of the biggest places where this manifests is in our relationship to “authority figures” in our life—a teacher, a spiritual leader, a boss, a judge, a medical professional, or the entire government. We might experience authority figures as the rescuer or the persecutor (or both, at different times). And, commonly, we find ourselves trapped in a cycle, known as the Drama Triangle, where we shift between the Victim, Rescuer and Persecutor. Keep in mind that this works a couple different ways. Your position could be an exact replication of your childhood experiences—a parent that either punished or protected you. But, it also can be the flip side, where you had loving parents, and therefore you experienced great pain, on the few occasions that they felt punishing. Or you had absent or abusive parents, so you fantasized about a real or magical person who would come save you. In either case, we are responding through our wounds. 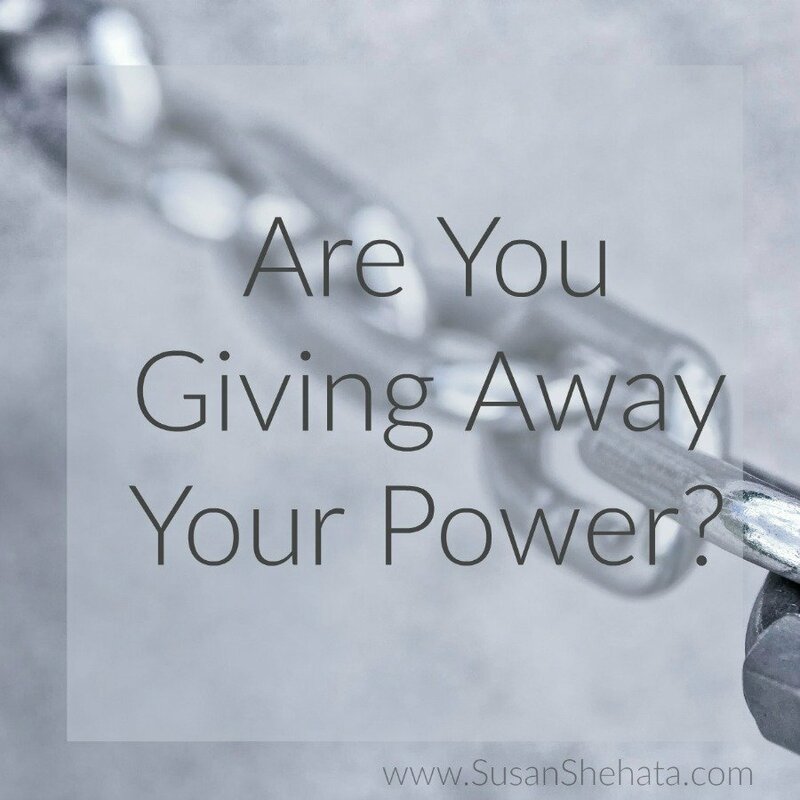 We are giving our personal power away to a parental figure. We do that because when we were small children, we were dependent on our parents, or caregivers. We had limited personal power. So, when our wounds are triggered, we regress back to a time when we felt genuinely powerless. When we feel powerless, we become less effective in transforming internal and relational conflict and creating solutions. We may feel the need to disempower others to protect ourselves, or we fall into fear, apathy, or something else altogether. That’s what we are currently witnessing and experiencing among people—many of us are hanging out in this cycle. Some feel at the mercy of their victim role, while others have moved into persecutor, because it feels more comfortable than being a victim. But, there is another choice! If you are giving the administration, or any authority figure, the ability to determine your INNER experience, you have just given away your power. You may feel that you have no choice, but that’s your wounded child speaking. Or you might think that’s fine, when things are going your way, but things can turn on a dime. When we learn how to take responsibility for our own inner experience, we stop subconsciously (or consciously) bouncing around the Drama Triangle. When we feel empowered, we are more likely to naturally come into a synergystic relationship within ourself or with one another. Make no mistake, there are people who are profiting off of your perceived powerlessness—no matter your current politics. You don’t take the rights of others away when you feel genuinely empowered (not just “in power.”) There is no need. Similarly, when you are standing in your personal power, even when you are genuinely victimized, you have more internal resources to respond to the situation. As infants and young children, we normalize any dysfunction that we do not have the power to change, as a coping mechanism. Our unmet needs, and the inability to meet those needs within our self, created a feeling of powerlessness. And, certainly, for many of us, that compounded over time, and we became adults who still do not know how to meet our needs internally—you may not even know what that means, or how you could possibly resolve that. So, that pattern of powerlessness and normalization can continue into adulthood. But we are no longer small children and we are not powerless. Through this process of personal empowerment, we step out of the above cycle altogether. And, as I said, while this doesn’t prevent painful things from happening to you or around you, it will give you more resiliency to respond. ← Can You Be Overly Attached To Trauma?